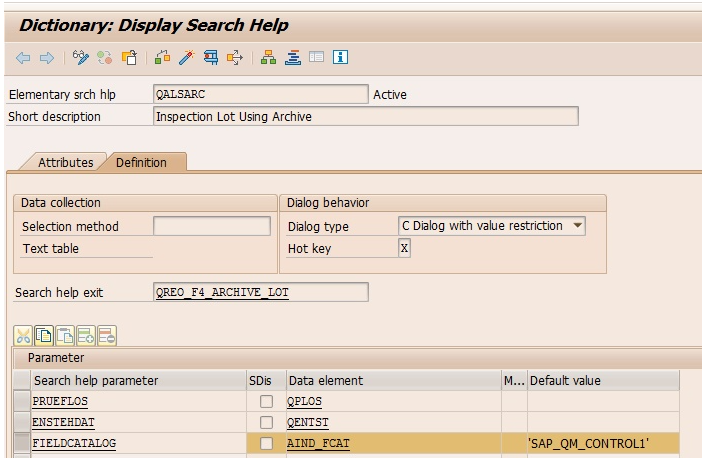 The below document describes how to assign custom FIELDCATALOG for Search help QALSARC. This might be necessary when working with Quality management application. Please be aware that this change would count as modification of the standard, but sometimes it can be useful, for example when displaying archived inspection lots. Default value of the field catalog (SAP_QM_CONTROL1) can be changed to the value of your own defined field catalog in transaction SE11. How to find your own field catalog? Field catalog for the Infostructure can be found on this screen. Enter QALSARC into Search help. Replace the Default value ‘SAP_QM_CONTROL1’ of FIELDCATALOG to your own field catalog. After this modification system will use the custom field catalog.